If you like blueberries and oatmeal cookies you will love these oat squares. 2. 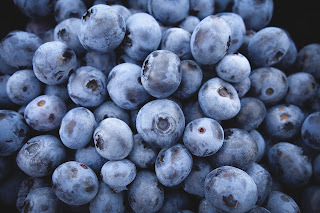 Combine the sugar with blueberries and orange juice in a large saucepan then bring them to a boil and simmer them for 10 min. 3. Stir in the cornstarch and cook them for another minute until they thicken slightly to make the filling. 4. Once the time is up, cover the saucepan with a piece of foil and allow it to cool down completely then refrigerate it for 1 h to 24 h.
5. Mix the sugar with flour, oats, salt and baking soda in a mixing bowl then add the butter and mix them until they become crumbly. 6. Set aside ½ cup of the crumbly mix then lay the rest of it in a greased baking dish. 7. Pour the blueberry filling all over the crumbly mix then top it with the remaining ½ cup of the crumbled mix that you reserved. 8. Bake it for 40 to 45 min. 9. Once the time is up, allow it cool down completely then cut into squares and serve it right away and cover it and refrigerate it for up to 2 days and enjoy.